The 100 season 5 will start airing Tuesdays at 8/7c in July, with the season finale set for August. Tonight (Tuesday) The 100 airs in its usual time slot, 9/8c, as it has done since its premiere in 2014. The 9 pm time slot has always felt like a good fit for the gritty sci-fi drama, which routinely pushes the boundaries of network television. However, starting July 10, the series will begin airing one hour earlier, taking over The Flash‘s 8/7c time slot on Tuesday nights. For the first time ever, The 100 will be serving as a lead-in for a new CW drama: the sci-fi/fantasy hybrid adventure The Outpost. Although we haven’t yet seen much promotion for The Outpost, it seems like a great thematic fit for The 100. Produced by the Stargate franchise’s Dean Devlin and Jonathan Glassner, The Outpost follows ‘strong female hero’ Talon, the last surviving member of the Blackblood race who is hunting her family’s killers in a world of magic, supernatural elements and fanatical religion. The series is being hailed as a mixture between Game of Thrones and Wonder Woman, with co-creator Jason Faller describing it as “a show for real fans, by real fans” (do they read Hypable, we wonder?). Although switching time slots halfway through the season might be inconvenient for audiences, it makes perfect sense that established drama The 100 is leading in the new series, as opposed to the other way around. Using it as a lead-in for a new show is also a sign of confidence from the network. The CW is clearly hoping that fans of the former will want to stick around for the new addition, and I imagine there could be a fair bit of fandom overlap if The Outpost sticks around. 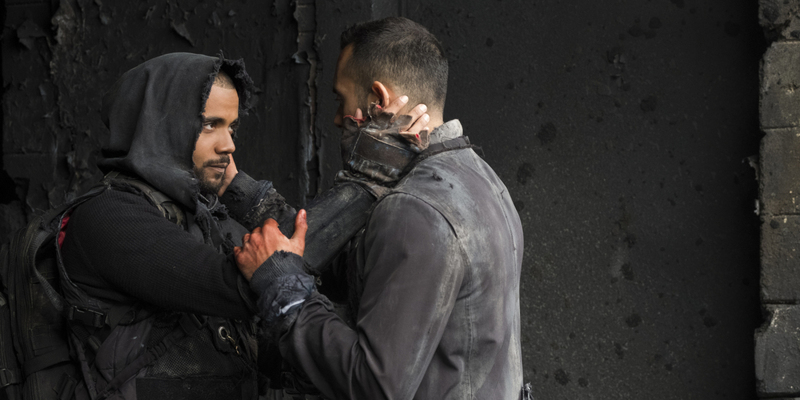 New episodes of The 100 season 5 will continue to air Tuesday nights at 9/8c for a few more weeks, but note that there is another break next week (June 12). The season 5 finale, “Damocles, Part 2,” has been scheduled for August 7, which means that there is one more one-week break still coming. We don’t yet know when that will be. While the three in-season breaks mean that the finale won’t have aired by July’s San Diego Comic-Con (which means we’ll get less exciting teases about the upcoming sixth season), it is nice to have the season extended a bit, considering how long the last hiatus was — and how long the wait for season 6 will undoubtedly be. The 100 season 6 will allegedly be 13 episodes long. No word yet on a premiere date or a time slot.